In a garden of flowering trees, after a spring rain, a gust of mild wind dislodges a shower of petals into your path. Pouran Jinchi does not paint flowers or gardens, but her paintings do bring the sublime a little closer to earth. 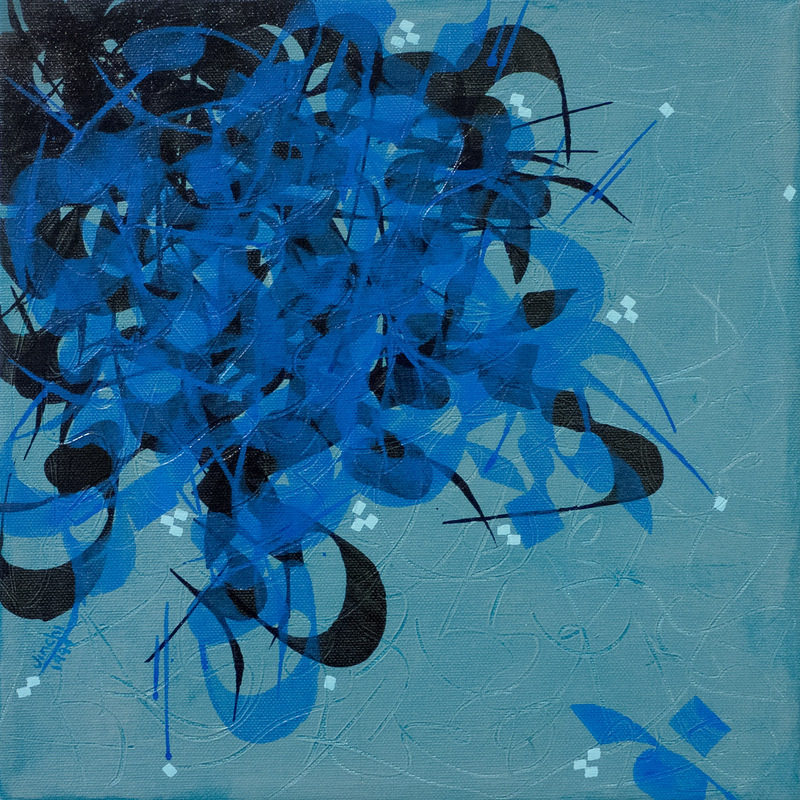 Red calligraphic marks and yellow accents float down over a pink ground from an upper corner in a painting on canvas; lyrical lines form a field of blue crescents hovering over atmospheric lavender; abstractions of Arabic letters cluster and form dark lines which loop across a blonde wood surface. These are Pouran Jinchi’s paintings. 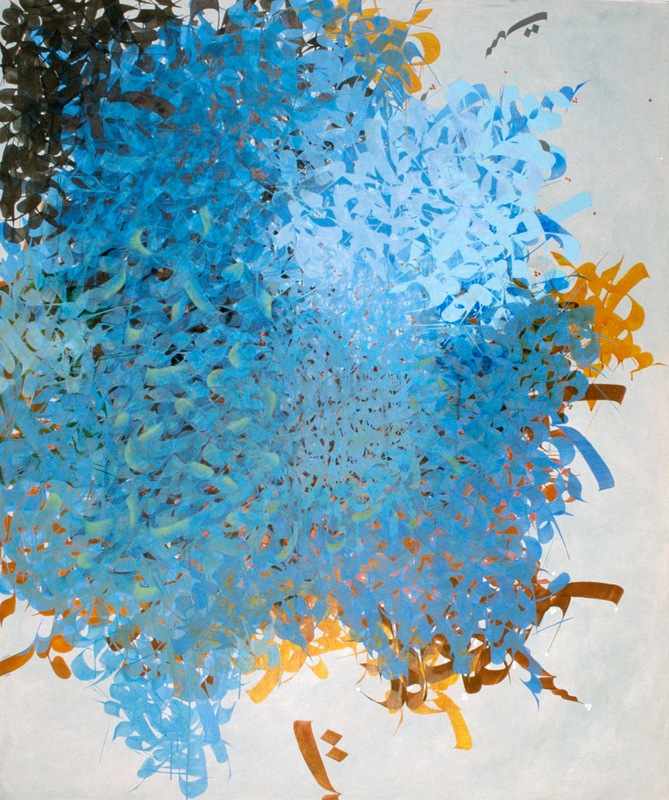 The abstract, lyrical forms in the paintings have their source in poetry and literature. 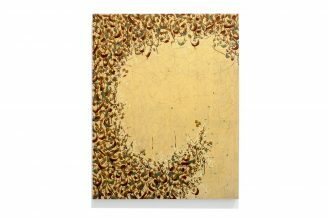 The backgrounds of the works are usually an even hue of paint and may contain subtle inscriptions, and the foregrounds offer abstract calligraphic marks created with vividly contrasting, brilliant inks and specialized metal pens. 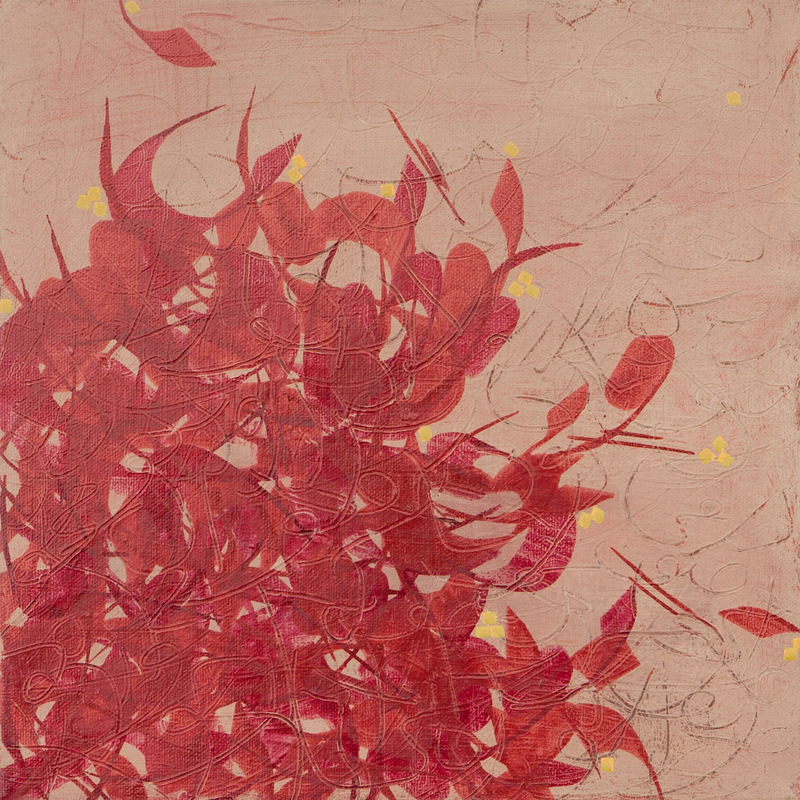 Jinchi uses various forms of poetry as a catalyst for her paintings, but varied sources of the words or texts for Jinchi’s paintings are not her focus. She makes the point that these selections don’t need to be translated and are just another chosen tools for the painting process. In the end, Jinchi’s aesthetic, aided by a sure hand trained in calligraphy and a confident approach, is clearly legible. 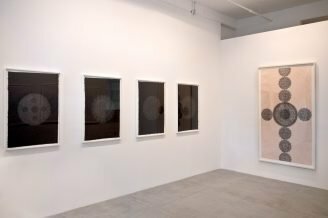 A contemporary artist, born in Iran, educated in the United States and residing in New York, Jinchi borrows from her home culture’s traditions of literature and calligraphy, and more broadly from the entire history of painting, to pursue her own aesthetic investigations. She has high expectations for her art, as her interests in mathematics, poetry and literature suggests. She says, “I come from a culture where directness and openness are not necessarily encouraged.” She elaborates and describes poetry’s historical function in Iran, “Poetry has played a very important role in the culture, because it has become a vehicle for expressions.” One imagines Jinchi would have her paintings’ impact be similar to that of her culture’s poetry when she says she is working to create a new “abstract language.” With text as her muse, Jinchi offers up a unique and contemporary aesthetic that transcends both language and abstraction.